Tribal tattoos have been around for thousands of years and they range from very different styles and meanings depending on where you go and which tribes you encounter or study. I myself have spent a decent amount of time looking into the different meanings of different traditional types of tattoos, but it was only today that I actually encountered a tattoo that signifies that its bearer is a cannibal. Yes, you read that correctly – a tattoo that signifies that its bearer is indeed the type of person who eats human flesh, aka a cannibal. How do I know this? 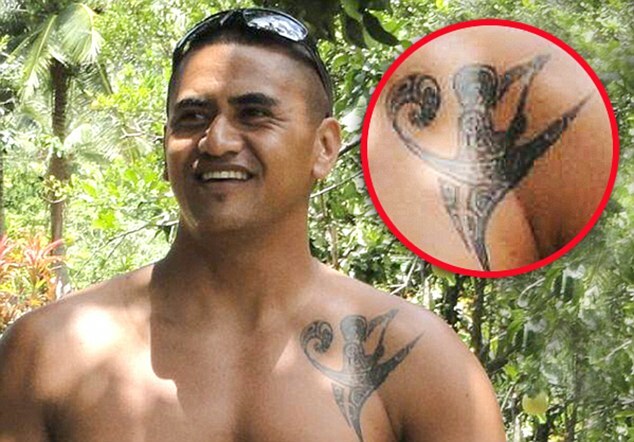 Well, unfortunately, there has been a cannibal attack on the French Polynesia island of Nuku Hiva and it has been revealed that the man suspected of the attack has a tattoo of the Kaioi tribe below his left shoulder. 31-year-old Henri Haiti had acted as a guide for 40-year-old German traveller Stefan Rami, taking him into the jungle to hunt for goats. Haiti is a guide, registered with the local authorities. But Rami never returned from the goat hunt and his charred remains were later found at a campfire site by authorities. ‘Fears that outdoor fanatic Mr Ramin had been cooked and devoured erupted after his charred remains were found on a campfire on Nuku Hiva following a goat hunt. This story is just plain crazy and at present time, Haiti remains on the run. Locals claim that there would not be any cannibals on their island and that such a thing has long since gone out of fashion. Yet it’s difficult to deny that cannibalism is indeed a possibility given Haiti’s tattoo, signifying his connection to the Kaioi people. I guess it’s true that some tattoos are more dangerous than others. I would recommend not getting too close to anyone who has a tattoo like Haiti’s and my sincere condolences go out to the family of Stefan Rami.